Happy 50th birthday to my childhood pet Dody. She was a Border Collie mix. Dody was my constant companion for 16 years. She followed me everywhere I went, playing, and school, everywhere. Dody and my father were best of friends when I wasn’t around. I got her at age five after my father felt sorry for me for trying to get my cat to act like a dog. We parted when I went off to college. Dody was another great role model in my life. Awwww. I loved our Doty. 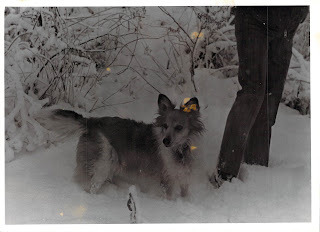 She was the first really "good dog" I ever knew. She was smart and obeyed if she was able to understand what you wanted from her. I always remember if Mama or Daddy let her out real early in the morning they would say "don't bark" and she wouldn't. Otherwise she greeted out doors with a loud bark. Yeah Dody did have that signature "hello world!" bark unless she was instructed otherwise. I still have the sketch of Dody you did Judy. The one that was on Daddy's desk so many years. Love the photo, a great pair of ears! She was so very cute too! Clearly you were very close to her. And you've gone on to allow other dogs to hold a place in your heart. This is something I've not yet reconciled myself. I keep wanting for another dog, but can't seem to bring myself to "replace" Shelby yet. I'm getting close though! wReg Burger? Or wReginald Burger?